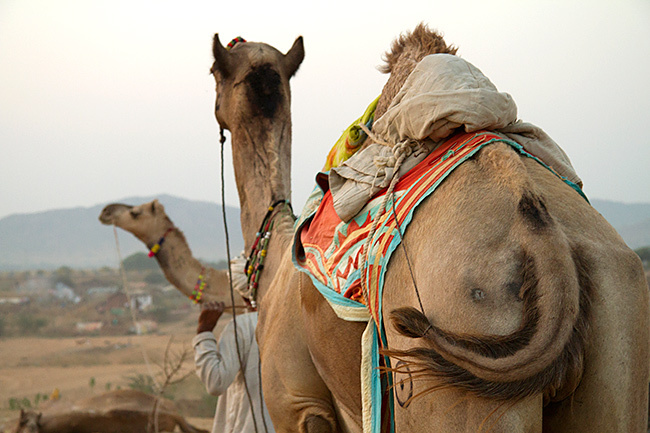 Seeing Past the Romance: The Pushkar Camel Fair | Julie O'Neill Photography. 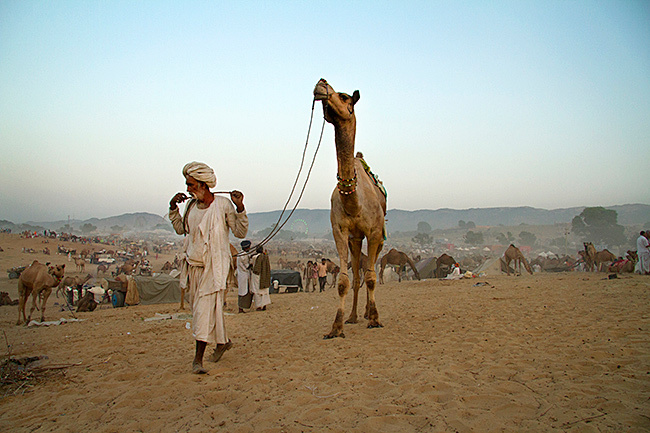 In Novem­ber of last year I visited the incred­i­bly roman­tic Pushkar Camel Fair for my second time. 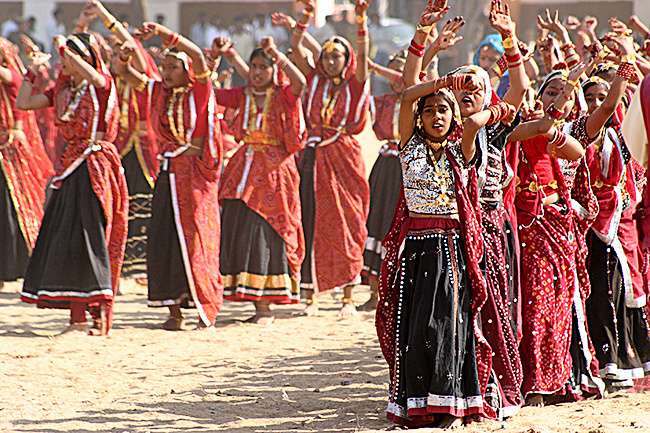 This yearly event is proba­bly the most fasci­nat­ing way to experi­ence authen­tic and tradi­tional Rajesthan culture. 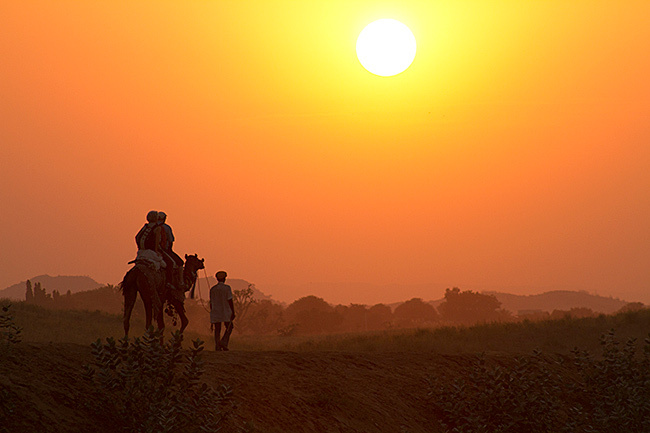 Each year thousands of villagers come together in this other­wise mellow Indian town. Along with them comes a sea of camels and other “livestock” to be bought and sold. For one week the town comes alive with bursts of colour, vibrant folk music, dancing, magic shows, acrobats, hot-air balloon rides, endless shopping and spicy local cuisine. 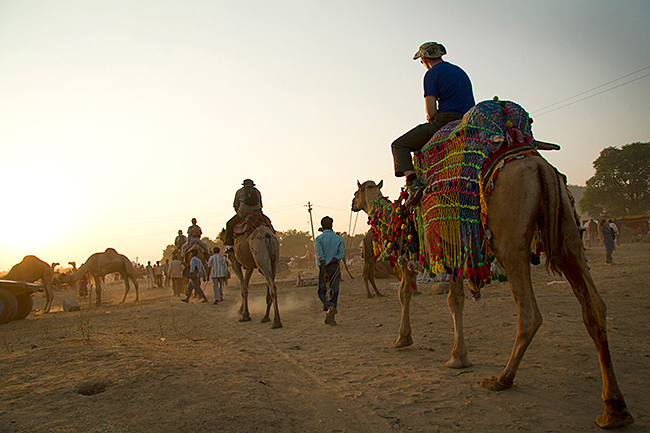 The fair is a hub of the local culture with the main attrac­tion being the camels, who are native to this arid desert environment. Each year this tradi­tional fair grows as a tourist attrac­tion bring­ing with it bus loads of tourists from around the globe anxious to experi­ence this sensory overload. For thousands of tourists the Pushkar Fair is a once in a lifetime, unfor­get­table adventure. 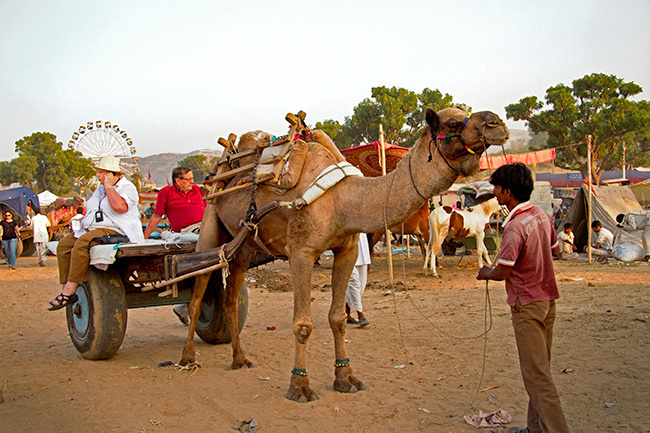 As someone who loves to travel and experi­ence the lives and tradi­tions of others, I can under­stand the draw to the Pushkar Camel Fair. It is a truly extra­or­di­nary and enlight­en­ing experi­ence for the visitors but for animals, it’s hell. The condi­tion of almost every one of these gracious camels is horri­ble but even more troubling is the endless stream of jolly tourists seemingly unaware of the suffer­ing around them. I was stunned at the hordes of people not even notic­ing the condi­tions the animals. All of whom were anxiously await­ing their turn to hand over their money, get their camel ride and finan­cially support this abuse. 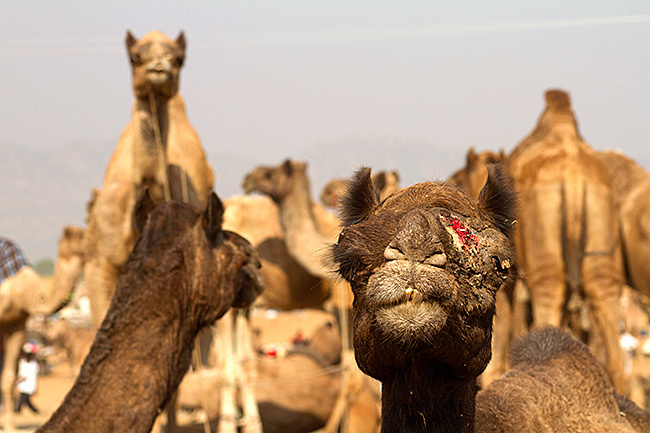 Is it possi­ble that so many people do not notice the condi­tion of almost every camel at the fair? Or are these tourists choos­ing to turn a blind eye to blatant animal cruelty and neglect? Maybe the masses of camel riding tourists feel that they are mere visitors in a strange land and that it is not appro­pri­ate to inter­fere. Well we already are inter­fer­ing. 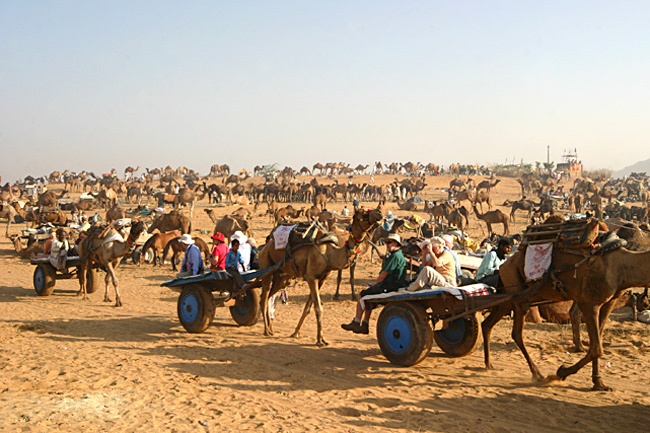 It is a result of the high volume of foreign tourists that flock to the Pushkar Fair and pay for these camels rides that there is so much demand and in turn supply of suffer­ing camels. I am sure that at home these crowds would not toler­ate such abuse and neglect. But here, on a once in a lifetime trip we choose to finan­cially praise the owners of these animals by taking camel rides which will only make matters worse for the animals. No matter where in the world we may find ourselves we have every right to stand up for animals that are suffer­ing at the hands of humans, we especially should not be paying for it. I ask those with plans of travel in their future to refuse to contribute to the exploita­tion of animals in the name of tourism. Each of us have the power to prevent these practices from flour­ish­ing rather than encour­ag­ing them. 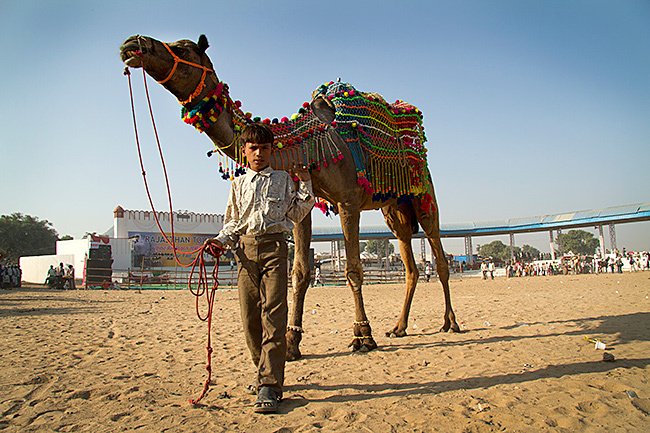 Please don’t think that I want to extin­guish the magic of the Pushkar Camel Fair and harm the liveli­hoods of the local people, I don’t. I merely want them to learn that tourists will not pay for abuse and neglect and that they must find kinder ways of profit­ing from tourism. Please pass this blog onto anyone that may be planning a trip to India, or anywhere else for that matter. Also please share this blog with those that work in the travel indus­try and help spread the word that support­ing animal abuse for tourism is not accept­able. As travellers we need to open our conscious­ness and stop finan­cially support­ing abuse, in every corner of the world. So very sad. I will forward this info to anyone I know of who is going to India. I have attended three fairs at Pushkar during my School days . I studied at King Georges School Ajmer and we had given our School PT demon­stra­tion at Pushkar Fair thrice. It was wonder­ful to attend such fairs. The fair was full of Camels and other animals. Australia had also imported many camels from this fair only. It gives India a wonder­ful name and fame for such a fair. In fact all foreign countries must be informed about it. 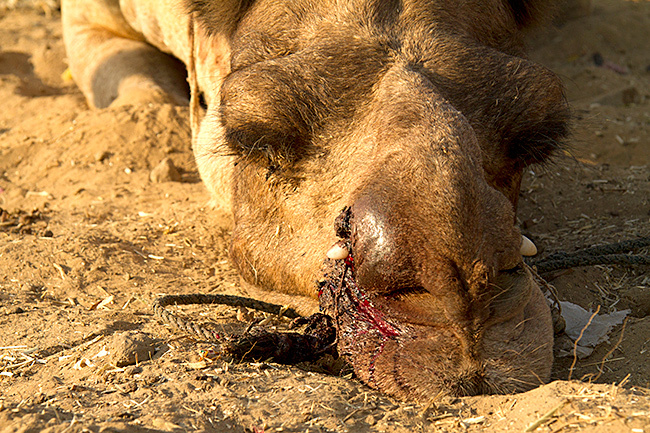 I was in Puskha last year — not at the time of the camel fair — and even then i saw cruelty and the horren­dous things camels (and other animals) are put through. It’s a beauti­ful place with some beauti­ful people, but no one seems to think very much about the care and welfare of the camels and horses that are used, among other things, for the grati­fi­ca­tion of tourists. Thanks very much for the pictures, they are stunning and i think, under­mine the romance of using these beauti­ful creatures for human ends. 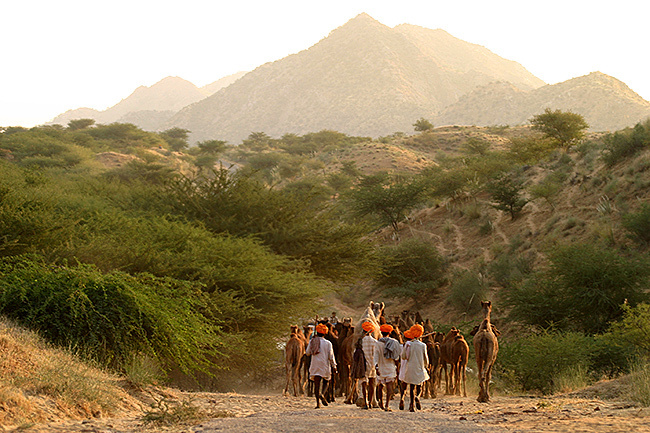 It is wonder­ful to see your Pictures , mostly of Camels from Pushkar. 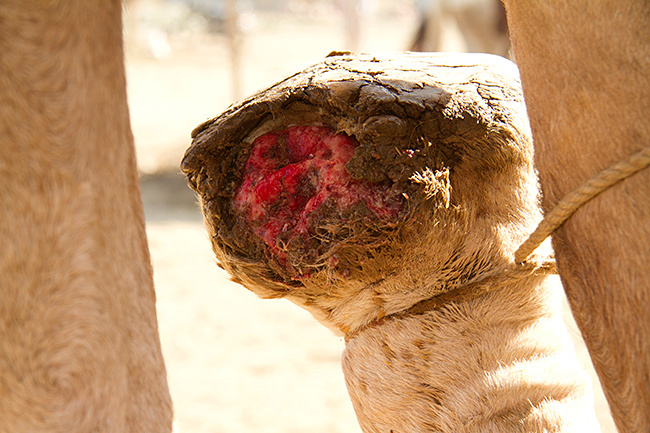 However I do not agree with some of your pictures shown here that people treat their Camels in such a shabby way.The Camel are not even treated medically is factu­ally not correct. All district in Rajasthan have Veteniary doctors provided by the Rajasthan Govern­ment. If the owners do not care for their Camels , it is they themselves are respon­si­ble for such lapses and sever action should be taken against them. I have two dogs( one– Golden Retirver and other Labrodor) and I have kept them very well. I feed them very well and very frequently have them vacinated. I love animals and in my younger days my father had kept four baffalos,four oxes&Cows, two camels and a few goats. To top it I used to take them out to graze the camels & goats in the open fields. Hello Yadav — Thanks for follow­ing the blog and your compli­ments on my photog­ra­phy. I am not sure how you can “not agree with some of the photos”. Unfor­tu­natley photos do not lie. 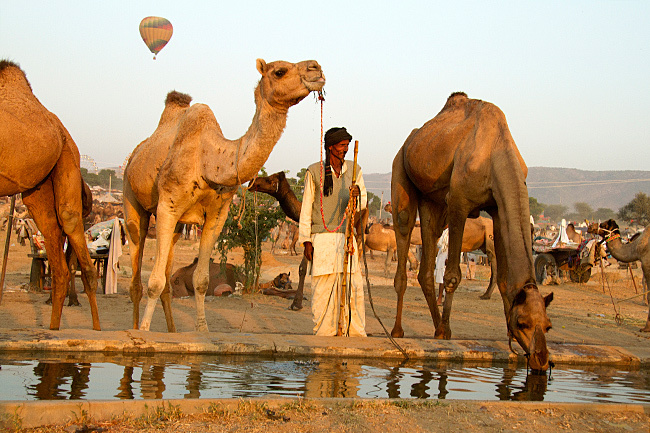 I invite you attend the Pushkar Fair this year and REALLY look at the camels. I assure you that the major­ity of camels have some kind of ailment and mostly are due to the nose pierc­ings. 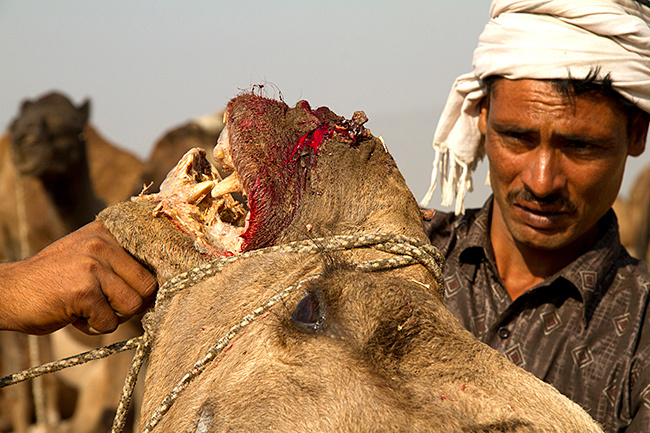 It is almost impos­si­ble to control a camel only by a rope through his nose and to not have the animal suffer. 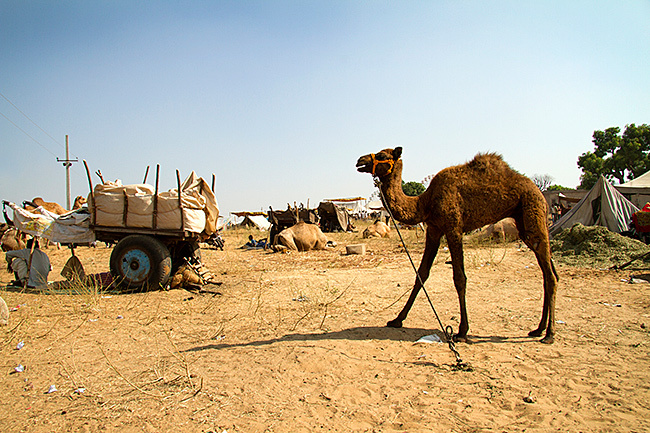 The saddest truth that I did not mention in the blog is that many of the camels who are weak, injured and old are sold for slaugh­ter at Pushkar Fair. From Pushkar in their weak condi­tion they will begin a long and exhaust­ing journey across the country only to be killed. It is nice that you love animals. I am glad that you feed your 2 breed dogs well and have them vacinated, as any responible “pet” owner should. Taking camels and goats out to graze alone does not assure that they are fully healthy or happy. 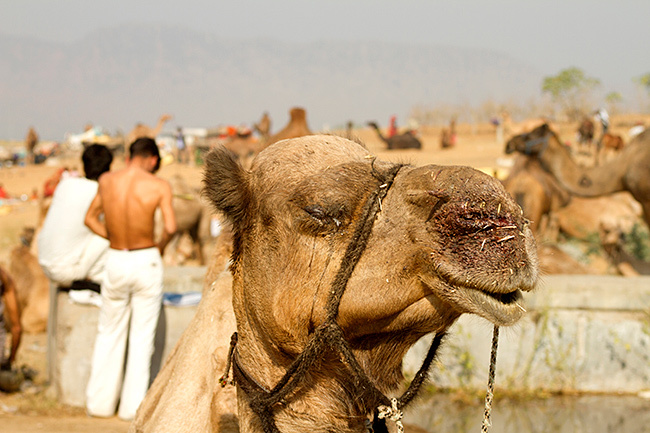 If you really love animals, you should be upset by my photos and want to HELP these camels, not only defend­ing the camel owners and the Pushkar Fair. 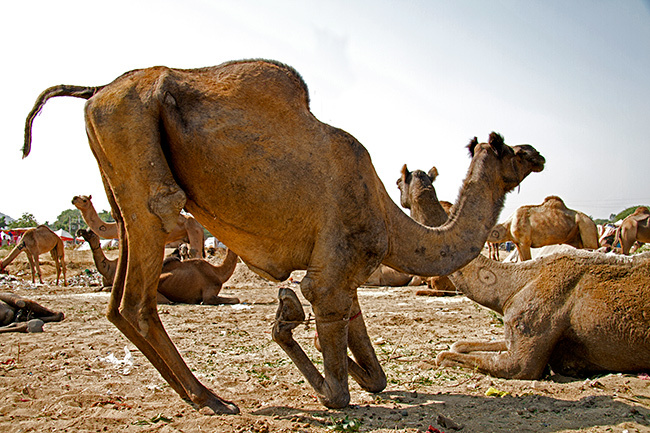 As for medical care, Help In Suffer­ing in Jaipur has the ONLY camel rescue center in all of India. HIS provides free treat­ment to camel owners and gives workshops on how to provide better care for camels owners. I have worked with them at their center and know first hand that HIS must physi­cally seek out the camels because the owners seldom are willing to treat their camels, even for free. Yes I agree with you, “If the owners do not care for their Camels , it is they themselves are respon­si­ble for such lapses and sever action should be taken against them”. That is the purpose of this blog. 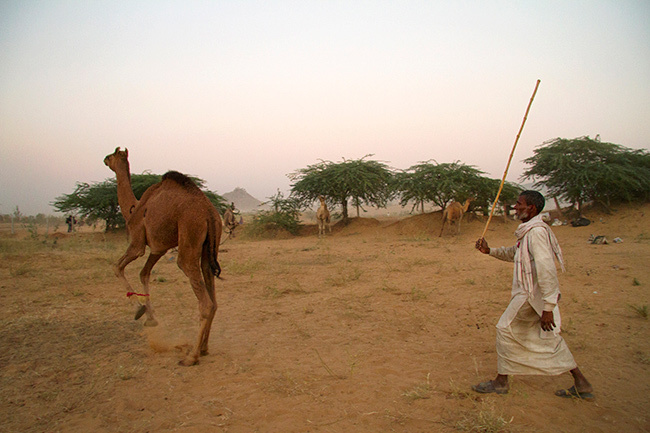 To raise aware­ness in hope of action being against these negli­gent camel owners. As for your earlier comment “Australia had also imported many camels from this fair only”. How on earth can this be good for camels? Imagine what the exhaust­ing and terri­fy­ing journey all the way to Australia would have been like for these poor, innocent animals. All I see is people making money from animals. I don’t see how this is good for and animals themselves. I must say that coming from an “animal lover” your comments confuse me. Thank you for this article. I am a camel owner and lover from Australia, I have spent time with camels and camel owners from the United Arab Emirates, Qatar, Saudi Arabia, America, Oman and India. 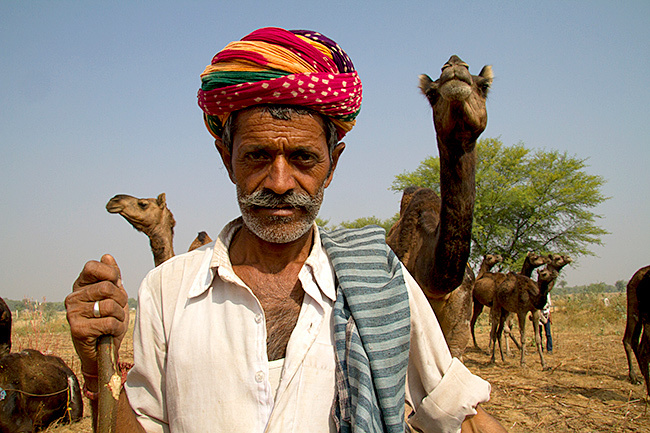 From my experi­ences of trekking with camels in Rajasthan I found two very differ­ent types of camel people. The first type are those that truly love and care for their animals, who have had their skills with camels passed down through gener­a­tions. They care for their animals to the best of their ability and resources and if you under­stand camels, you can recog­nise the love the camels have for these men. Then there are the second type — the tourist type. They are the ones that have jumped on the camel riding band wagon and are trying to make a quick rupee. They are the ones who don’t under­stand camels or their manner­isms and are quick to lose their patience, beat the animals and often starve them. A true camel lover will feed their camel before themselves, as I have done many times. 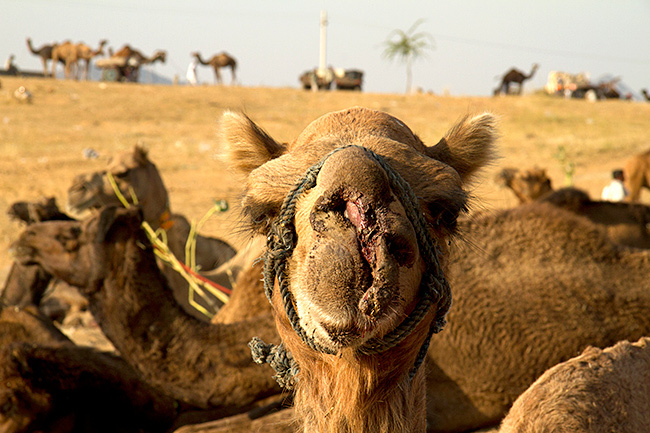 The condi­tion of many camels in India truly made me ill and caused me a lot of distress. However, my issue with your article is this — I cannot see any problem with the second last picture you posted. As an owner of these very much misun­der­stood animals, my hackles stand on end when I see people criti­cis­ing that which they do not under­stand. In this picture, there are three camels, all of which are in GOOD condi­tion. They are a healthy weight and have healthy coats. I’m not a fan of the scarring but this is similar to brand­ing of cattle. 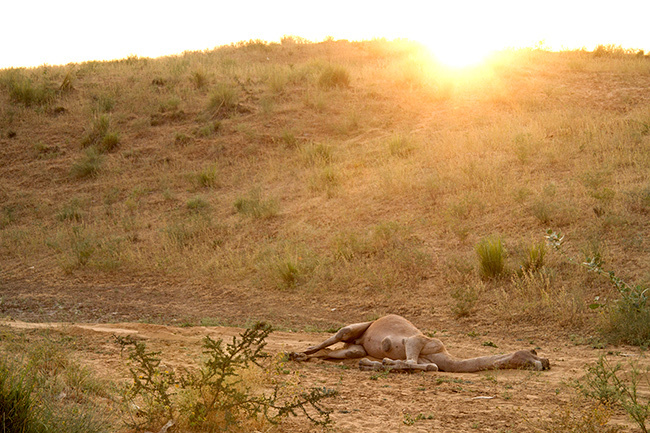 If you knew ANYTHING about camels, you would know that not just anyone can lay on their camel like this. 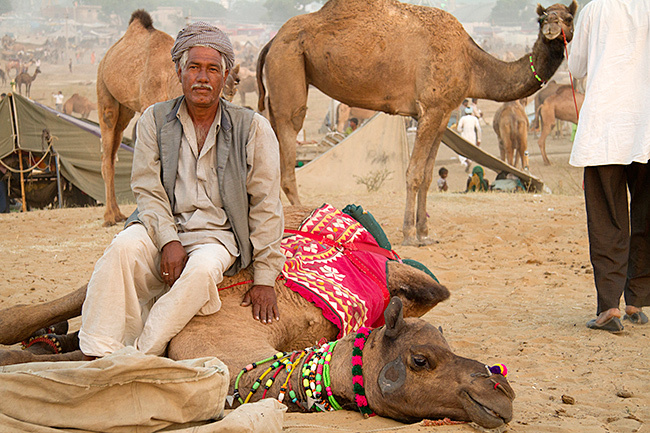 This camel trusts and loves this man, and proba­bly adores the atten­tion. I lay on my camels all the time, rub their bellies and scratch them and they love the atten­tion, camels are very affec­tion­ate animals and if you have earned their trust and they let you do this, you are very blessed. I feel sad that you would use such a beauti­ful picture to draw atten­tion to your, other­wise very valid, animal welfare story.